She's only got 10,000 on the clock and original owner just didn't want her any more. Go figure. So good for me! I did a full interior LED swap and it surprisingly took less than 20 min to finish and completely changes the look and feel. She goes in to Audi tomorrow for a free "hardware" upgrade. I guess they're swapping out the slow-*** 3G for 4G LTE. I'll report back with speed improvements if at all noticeable. Can't see how it won't. Any other "mods" I should consider but just don't know about? 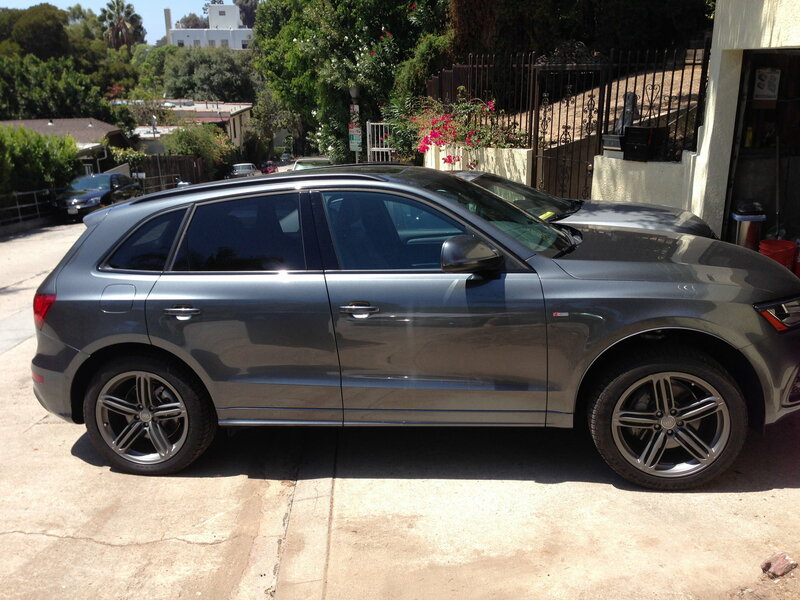 Congrats and welcome to the Q5 TDI club. Excellent choice and find. I highly doubt Audi is giving you a 4G LTE upgrade. You Q5 is probably in a TMobile area that only provides 2G for Audi Connect. They will change modem so you will receive the 3G band of TMobile. You should know that there are alternatives to the standard Audi Connect plan. A prepaid service such as USMobile could be more cost effective if you don't plan on using the data plan for streaming music, etc. Many threads on this in the forum. Congrats on the q5. Can you give us an update on the free hardware upgrade? I'm bringing my 2014 tdi in for service next week and am wondering if I need to ask about the upgrade as well. Thx! When I called Audi Connect to, well, connect me, she told me on the phone that my vehicle was eligible for the upgrade because of the area I live. (her words) I know now that they swapped out the old 2G (even though your screen displays 3G) receiver to a legitimate 3G. I also had second thoughts about signing with Audi Connect after reading the vast posts about other options available. I think that since I was about to hook up with Audi Connect they then referred me to the upgrade. Not tragically expensive as long as you sign up for the 30 month package for $450. Only $15/month for unlimited data. But after the upgrade I ended up going with US Mobile. Only $7/month after taxes and whatnot for 250MB. So simple and so much faster loading pages after the upgrade. I think you need to express interest in signing up with Audi Connect for the upgrade to happen. I even received a call a week later from the dealership asking how I was notified about the upgrade for their billing purposes I believe. Well, I think I found a hell of a deal. PO wanted out of his lease (for whatever reasons) and didn't want to face the early termination fees. So his only other options were to either have someone else take over his lease or buy out his lease. I don't like leasing so I opted for the latter. He contacts Audi Financial and asks how much his buyout is and my bank writes them a check. His banks signs title over to my bank and he's now free and clear. But in the end, he essentially broke even. All in all in the end after taxes and BS I shelled out 49k for a 2014 TDI Premium Plus B&O S Line with 11k miles and Prepaid scheduled maintenance. I think your resale is holding up just fine. Let's not forget that diesel prices here in CA are still about a buck cheaper than premium. I looked at 2015 TDI's with nav and backup cam and they're around $52k (non S line) sticker price. [QUOTE=Dudealicious;24723411] I think you need to express interest in signing up with Audi Connect for the upgrade to happen. No you don't. If your car is registered in an area affected by the T-Mobile "system upgrade", just before the "upgrade" happens, you should receive, or have already received letters from both T-Mobile & Audi notifying you of the availability of the new hardware upgrade which allows you to simply maintain your 3G connection. I think you need to express interest in signing up with Audi Connect for the upgrade to happen. That's how it happened with me. Audi A4 B8 8K 2.0 TFSI - Engine Repair, what do you think? VCDS Friends in Northern California?